He now has homes in both Los Angeles and the Isle Of Man. Away from acting, he is a keen collector of vintage cars and also holds a pilot's license. 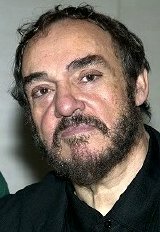 John Rhys-Davies was born in 1944 in Salisbury, Wiltshire. His parents were both Welsh - his father was a mechanical engineer and his mother was a nurse. He spent his childhood in Ammanford, Wales, and also in Cornwall, where he was educated at Truro School. Since leaving RADA, Rhys-Davies honed his skills as a stage actor, appearing in over one hundred plays, including Shakespeare with the RSC at Stratford. 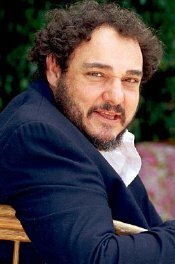 John Rhys-Davies has appeared in just the one James Bond film The Living Daylights (1987) where his character is the Russian General Leonid Pushkin, an ally of James Bond played by Timothy Dalton. 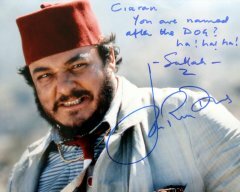 1981 saw Steven Spielberg cast Rhys-Davies as the comic, fez-wearing Sallah in Raiders of the Lost Ark, the first of the Indiana Jones films. Rhys-Davies' comedy skills made Sallah a favourite with audiences, and he played the character again in the second film Indiana Jones and the Last Crusade (1989). In these films he worked alongside Harrison Ford and Sean Connery. 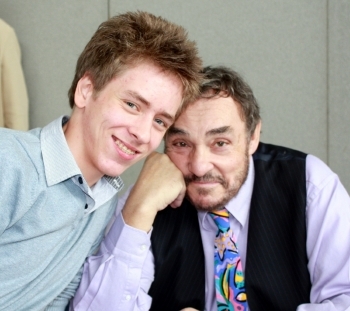 I first met John Rhys-Davies in May 2005. I met him again at Milton Keynes in September 2008. As I expected, he was again very friendly - he even remembered me! 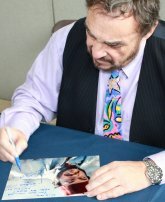 He signed several things for me including my litho of The Living Daylights, two Indiana Jones posters and a photograph of him as Sallah. Royal Academy of Dramatic Art, after briefly working as a secondary school teacher. later, he and Hurt teamed up again, along with Derek Jacobi and Patrick Stewart for the BBC's three-part adaptation of Robert Graves' I, Claudius. 96). 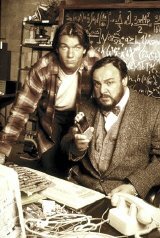 He found more fame in the medium of television - playing Professor Maximilian Arturo in 40 episodes of the time-travelling series Sliders (1995-97). 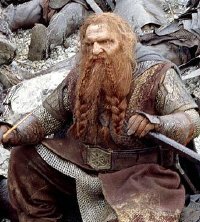 John Rhys-Davies signed this photo for me. 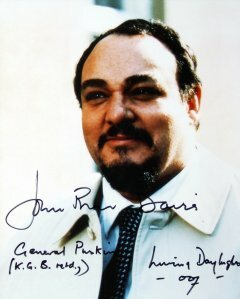 John Rhys-Davies also signed this photo for me. wear heavy facial prosthetics which took five hours to apply. 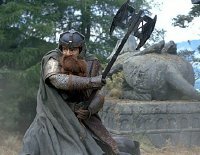 The 6' 1" actor also had to perform on his knees in order to portray the 4'2" dwarf! The three films of the trilogy were all shot simultaneously in New Zealand, over a period of 18 months. from Alzheimer's. They have two boys Tom and Ben. 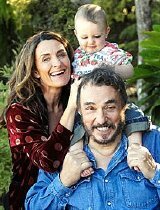 Rhys-Davies also has a daughter by his current partner the former TV host Lisa Manning.